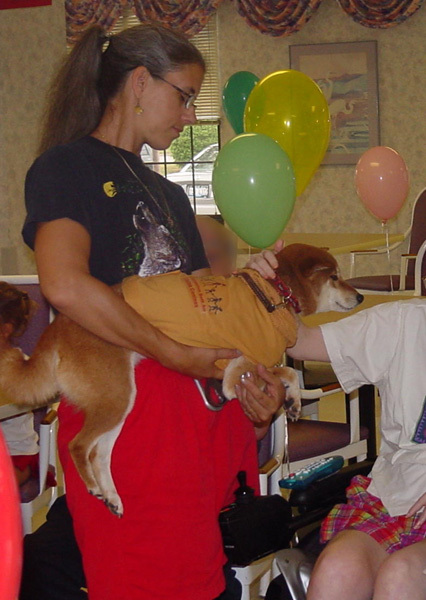 Princess Cheba of Shady Tree, Cheba made the rounds at the Lexington Health Care (nursing home) in Wheeling, IL on Sunday, July 28, 2002. As the first member of Congregation Beth Am’s (Buffalo Grove, IL) Caring Canines group, Cheba joined the Caring Kids and their families on an outing to bring companionship and cheer to the residents on a hot, humid, Sunday morning. Cheba was a true ambassador for the Shiba breed as she went from room to room on every floor bringing smiles to all the dog lovers at the Lexington. From laying next to a bedridden dog lover, to sharing eye contact with a charming gentlemen for 10 minutes as he stroked her neck and crooned to her, Cheba found no challenge to great and no task to hard to undertake.